What would you do with a big lottery win? Give it to charity? Buy a new house? Fancy car? Private island complete with speedboat and butler? We all have different dreams and aspirations when we sit and excitedly discuss that ‘what if’ moment. There are numerous ways to win big cash prizes, whether you play the same numbers on the Euromillions every single week or play games of chance on sites such as SuperCasino; we all have a flutter now and then and cross our fingers hoping for that big win. A quick reality check though – according to expert calculations the chances of winning the lottery, in the UK alone, is 1 in 14 million. Around the world there are numerous versions of the lottery, in the UK we of course have the Lotto, in the USA the Powerball or Mega Millions and for the whole of Europe you can take part in the Euromillions. So who scooped the biggest wins around the world and what did they do with the money? In October 2010 this winner’s prize amount went third on the National Lottery rich list, but they chose to remain anonymous. Adrian and Gillian Bayford scooped up the massive cash prize on the Euromillions and quickly went out to spend their win on sports cars, holidays and a Grade-II listed house in Cambridgeshire. However the stress of managing their money and their stately home led the couple to file for divorce just 15 months later, suggesting that perhaps money can’t buy you happiness sometimes. In 2012 the largest jackpot and single-ticket jackpot win occurred in Euro currency. The winner decided to remain anonymous. Colin and Chris Weir from the UK won a huge jackpot on the Euromillions lottery in 2011. The couple, married for 30 years, have two children and spent their fortune on their friends, family and buying a dream mansion home worth £3.5 million, which they reportedly spent just 10 minutes viewing before committing to buying. Seven IT employees chipped into the lotto pool at work and after taxes each walked away with $19.1 million each. With their winnings they reportedly said that they would spend their money on a dishwasher, tyres and college educations for their children. Louise White, of Rhode Island, chose to use her winning funds for a charity she set up called the Rainbow Sherbert Trust, named after the dessert she bought alongside her winning ticket. She said that she kept her ticket in her Bible, which she slept with, until she could get to a bank and put it in a safe deposit box. When Jim and Carolyn McCullar, based in Ephrata, Washington won big on the Mega Millions lottery they claimed that they weren’t going to buy a jet and fly around the world but take a more humble approach by putting the winnings in the bank, writing some cheques for their kids and donating to charity. 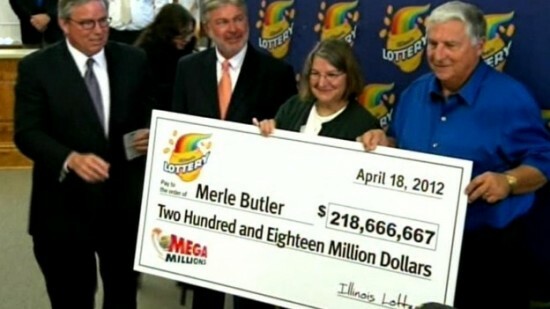 An 84-year-old lady, Gloria MacKenzie, claimed this big cash prize on the Powerball over in the USA. She apparently only got her hands on the winning ticket because a kind person in the line let her go ahead of them, where she then purchased the winning ‘Quick Pick’ (lucky dip) ticket. In the USA lottery win cash prizes are taxed, so the prize fund paid out was actually $474 million but it still stands as the largest win in the history of the lottery. This was split between six winners so, before tax, each person received $218.6 million each. Two of the winners, Merle and Pat Butler were humble about their winnings and decided they’d invest and maybe go on holiday. The other three winners chose to remain anonymous. If you like to play lotto then you may be interested in learning how to win the powerball draw. Winning the lottery is possible. A Brief Look at Lotteries Near and Far!